When I was at GamesDay 2003, I managed to get my hands on the new ForgeWorld Epic Ork Gunwagons (which are the Epic versions of the FW 40K Gunwagons). They are good value for money, just £5 for three, and there are four different types. However now I have got them out and undercoated them. They are very detailed models, though the exhausts are somewhat delicate and many of them were broken in transit. These have been sitting around since I undercoated them (doing other stuff), however when I did undercoat them I didn't undercoat the underneath (rarely do with metal models). Started the black parts when I realised that the underneath (which was fresh resin) would not accept the acrylic paint I was using. It looks like I will be forced to undercoat the underneath before I can continue with the paint job. 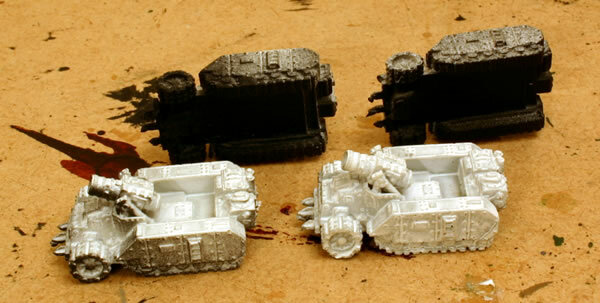 I have now undercoated the undersides of the Gunwagons with black paint. I have continued with the black paint jobs.